Yesterday, The Legal Genealogist set out in a footnote a point that really needs to be given a whole lot more emphasis than a single footnote can provide. Why in the world, you might ask, would the FTC care what a blogger says in a blog? In addition, the Guides say if there’s a connection between an endorser and the marketer that consumers would not expect and it would affect how consumers evaluate the endorsement, that connection should be disclosed. For example, if an ad features an endorser who’s a relative or employee of the marketer, the ad is misleading unless the connection is made clear. The same is usually true if the endorser has been paid or given something of value to tout the product. The reason is obvious: Knowing about the connection is important information for anyone evaluating the endorsement. Makes sense, doesn’t it? Yesterday, I did a review of a new book. It’s important for you to know I got a copy of that book free from the publisher. It would take a whole lot more than a free book to influence my opinion5 but how can you know that if you don’t know me — and don’t you deserve to know that I got to keep a copy of the book so you can make up your own mind about the value of my opinion? That’s the whole deal behind the FTC rule and it’s a rule all of us as bloggers need to know and pay attention to. 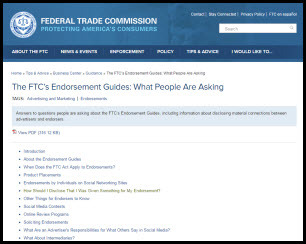 The FTC Guides online — and “The FTC’s Endorsement Guides: What People Are Asking” is a good overview — explain in plain English what we’re supposed to do, why and how. The FTC is all about trying to make a fair and level playing field. As bloggers, even in a small field like genealogy, we too have to play fair. Seems obvious, but it’s good to know there are rules for it. Is disclosure also required for affiliate links? Where a person clicks a link from your site and if they then buy a product, you get a referral commission? It’s there too, Louis: see here. Thanks for the Notice. All Products on my Blog that I Endorse, I have purchased their Services. Thank you for letting us know Judy. This makes me even more glad that I don’t advertise on my blog, nor do I have affiliates. Just blogging to tell my ancestor’s stories and hopefully connect with cousins.